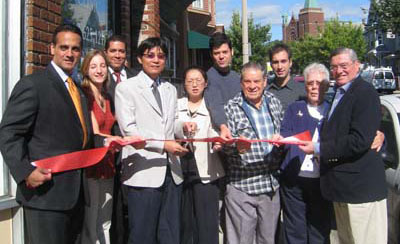 The Cambridge-Somerville-Medford Acupuncture Clinic is in Somerville bordering Cambridge, Medford, and Arlington, MA. It is a general clinic that treats various chronic conditions. It offers a full range of traditional Chinese medicine therapies including: acupuncture, Chinese herbal medicine, Tuina massage and selfcare healing exercises. It has a full service herbal medicine pharmacy that provides 300 plus Chinese herbs. 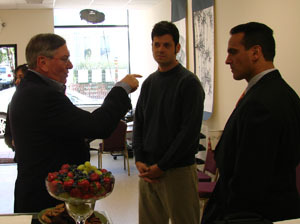 On September 19th, 2008, Mayor Joe Curtatone and Ward 4 Alderman Walter Pero (far right) joined Chi Wellness Director & Founder Miles Chong Chen, PhD, staff and neighbors for for a ribbon cutting ceremony in celebration of our grand re-opening at 368 Medford Street. The Medford Street site is the newest of four locations of Chi Wellness Clinic, which include Boston, Waltham, and Manchester, NH. Chi Wellness Clinic, founded on the morning of September 11, 2001, focuses on holistic medicine and remedies to pain, infertility, stress, and various chronic illness. Both Mr. Pero and Chef Peter Ungar, Somerville residents of Ward 4 have been treated by our staff at our Boston and Somerville offices (see photo below). It has an open herbal pharmacy and reception area in the front, seven spacious treatment rooms in the back and a small outdoor herb garden in the backyard. The tranquility and peace makes this clinic feel like an oasis amidst the busy and bustling urban activities of Cambridge and Somerville. Within walking distance are Somerville City Hall, Lechmere Mall, Union Square and Davis Square. It is a short distance from Tufts University, MIT and other universities. As a neighborhood clinic, we offer acupuncture, Tuina massage therapy, herbal medicine and Tai Chi classes to residents of Somerville, Cambridge, Medford, and Arlington.